Q. How do I chase citations through the library search? 1. Start at the EKU Libraries homepage. Usually it will appear in your first screen of results. But sometimes you will not be able to find your article. 2. Can't find your article? You may need to uncheck the box beside the Available in Library Collection limiter to tell the EBSCO Discovery Search to search all content and not just what the library has. We have unchecked the Available in Library Collection limiter and managed to find the article we were searching for. 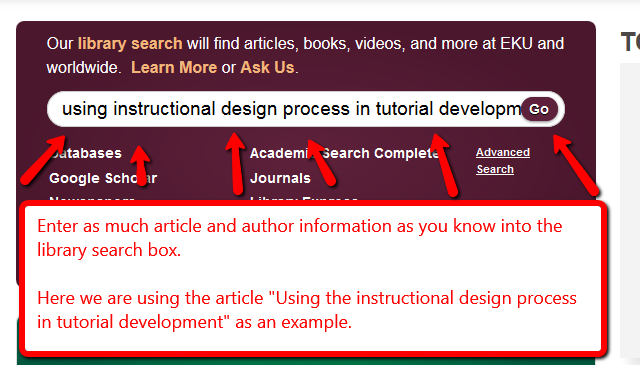 Just click on the FIND FULL TEXT link to immediately access or request the article, depending on its availability. The library recommends using Google Scholar when searching for known article title citations instead of the library search. It's easy to use and avoids the confusion and messy steps sometimes needed when using the EBSCO Discovery Search for known citations. FAQ: How do I chase citations through Google Scholar?